Below is a list of items we carry that students typically use for photo classes in high school and college. These products are also used in home darkrooms and photo labs. If you need a 35mm camera check out our listing for used cameras. 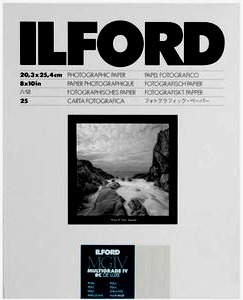 Ilford We Stock Multigrade IV RC Deluxe in 8×10, and 11×14 in Glossy, Pearl, and Satin surfaces and Fiber paper in 8×10. The full line of Ilford paper can be ordered. Ultrafine The full product line can be ordered. Miscellaneous: We carry print and negative protector sheets from Printfile, antistatic cloths, and camera batteries. For students taking color classes we have Fuji 8×10-100 sheet boxes of RA4 color paper in the Matte finish.